Infants, children and adolescents living with allergic or immunologic diseases have unique needs in the assessment and management of these chronic conditions. Many conditions such as food allergy, atopic dermatitis, asthma, allergic rhinitis and primary immunodeficiency present in early childhood and often require health advocacy and collaboration on the part of the Clinical Immunology and Allergy specialists, primary care practitioners, nurses, certified asthma educators, and dieticians involved in the delivery of health care to this patient population. Patients with food allergy and asthma are at high risk for anaphylaxis, a severe and potentially life-threatening allergic reaction. 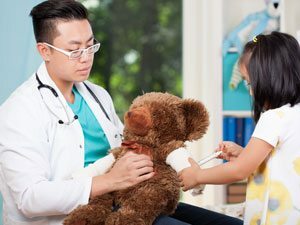 Other allergic conditions such as adverse reactions to vaccines or medications, like antibiotics and chemotherapeutics, can pose unique challenges in the long term management and outcomes among young patients. In the last two years, the CSACI Pediatrics Interest Section has worked diligently to advocate for early infant introduction of all foods beginning at 6 months of age. Additionally, this section has collaborated with key stakeholders and partners, including the Canadian Pediatric Society, to create a position statement for pediatricians encouraging early introduction of all foods, including the top 10 Priority Allergens identified by Health Canada. Growing medical evidence is mounting that delaying the introduction of foods until later in childhood increases the risk of developing food allergy. Many other exciting projects and collaborations are on the horizon in conjunction with the CSACI Anaphylaxis and Immunodeficiency Interest Groups. Pediatric Clinical Immunology and Allergy Specialists are certified through the Royal College of Physicians and Surgeons of Canada by completing 3-4 years of Pediatrics specialty training with an additional 2 years of further training in the area of Clinical Immunology and Allergy. Food Allergy Canada educates, supports and advocates for the needs of people living with food allergies and the risk of anaphylaxis. Health Link BC has many great articles such as prevention of food allergy in infants and eczema and food allergy. Translations are available in many languages. Chan ES, Cummings C. Dietary exposures and allergy prevention in high-risk infants. Paediatr Child Health 2013;18(10):545-9. HealthLink BC, 2013. Reducing risk of food allergy in your baby: A resource for parents of babies at increased risk of food allergy. Endorsed by the Canadian Society of Allergy and Clinical Immunology. Caring for Kids: Food allergy vs. food intolerance: How can I prevent them? and Feeding your baby in the first year. Global Initiative for Asthma (GINA) pocket guide for asthma management and prevention (for children 5 years of age and younger).